It’s 1798, and French-style revolutions are breaking out all across Europe—which puts us squarely in Scarlet Pimpernel territory. Only this time, the noble outlaw with the secret identity is on the side of the revolutionaries rather than the aristocrats. Maria Carolina, Queen of Naples (Binnie Barnes, playing an uncharacteristically timid character), is terrified there will be a people’s revolution in southern Italy, and her head will go the way of her relative Marie Antoinette’s. Her fears are stoked by her evil Chief of Police, Baron Holstein (Massimo Serato, suave, handsome, sinister, and cruel), to whom she gives sweeping powers. Meanwhile Count Amalfi, amusing fop and wit-about-court, tries to calm the queen’s fears—but then the daring raids of the masked pirate Captain Scirocco set her off again. 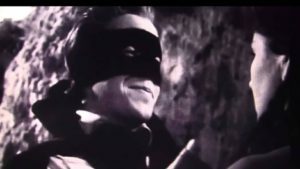 Louis Hayward plays both Count Amalfi, fopping it up by day, complete with quizzing glass and a series of ridiculous wigs, and the revolutionary outlaw Captain Scirocco, rabble-rousing by night with black mask and sword. At this point Hayward had been playing gallant swordsmen fighting oppression for over a decade, and here one can see that he’s just starting to phone it in, though he still manages to work up some of the old charm for his scenes with the count’s fiancée, Lady Mercedes (Mariella Lotti, surprisingly good), whom he romances as both Amalfi and Scirocco, thus becoming his own rival. This was shot on location in Naples and the nearby island of Capri, plus the first scene is set at sea aboard a sweet period 60-gun three-master man-o’-war, which Scirocco loots of a weapon shipment to arm his rebels. The film makes the most of the authentic locales, and the director, film-fan favorite Edward Ulmer, a low-budget Orson Welles, does wonders with light and shadow on a shoestring. After the police raid a gathering of revolutionaries, to draw them off Scirocco leads the guards away in a breathtaking chase across the tiled rooftops of Naples, scrambling across famous façades like something right out of Assassin’s Creed. The story makes a hash of the actual history of the Neapolitan revolution of 1798-99, but we forgive it because of the brilliantly-shot final duel, acrobatic and brutal, between Scirocco and Holstein in a Naples theater, as brawling rebels and guardsmen pour into the building through the shattered doorways. Wow.